The highest demand is from June through September as well as different holidays or fishing tournaments during the year. 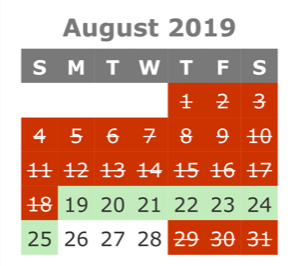 See the calendars on this page for availability. Popular times book very early. See section after calendars for recommended leadtime for booking. 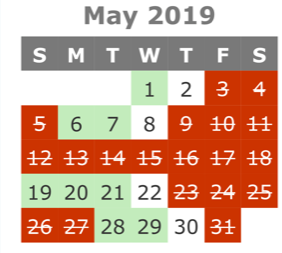 RED = Booked/Not Available that Night. NOTE: See below calendars for additional information. Book them together for parties up to 24 people! Sorry, this calendar is currently not working. Go to “VRBO” using link below. Then scroll down to near the end of the page and you will find a calendar. Note: A second example is provided below at end. WHITE = Current Calendar does not support. Consider Fall, Spring and Winter for lower rates. The first half of June and the second half of August are slightly lower than mid summer. September is less also and one of the best times of the year. See the graph/chart on “Rates” page more information on approximate rates through the year and what activities are still attractive at that time frame based on weather. Aug 19-29 (10 nights), 20-29 (9n), 21-29 (8n), 22-29 (7n), 23-29 (6n), 24-29 (5n), 25-29 (4n), 19-28(9n), 20-28 (8n), 21-28 (7n), 22-28 (6n), 23-28 (5n), 24-28(4n), 19-27 (8n)….., 19-26 (7n)….., etc.